I’m back home in Germany! When I return from a longer trip I always need a few days to sort myself out and get used to my usual routine. No more early morning riverside walks and lunches in small French bistros – but there is an upside to it too; I finally have access to a printer and scanner again and get to go through all the mail and parcels that have accumulated here in Nuremberg while I was away 😉 . And of course I couldn’t wait to check out my local DM and Rossmann drugstores to see what new products were launched in Germany while I was on vacation in France. I was particularly eager to try out the new Perfect Teint Gel-to-Milk Cleansing Gel from DM’s organic own label brand Alverde. I really like this kind of cleansing product, like the Aciana Botanica Gelée d’Huile Démaquillante from French brand Sanoflore. The yellow-golden Alverde gel is based on glycerine and sunflower oil so it is less oily than a classic cleansing oil. The emulsifier is sugar-based sucrose stearate which is responsible for turning the gel into a milk once it comes into contact with water. This emulsifier is very gently and doesn’t dry out the skin so the cleansing gel actually felt quite hydrating when I used it. The fragrance is unusual and a little too strong for my taste: I can smell vanilla but also white blossoms and mint. The Perfect Teint cleansing gel costs 2.45 Euro and is available in all DM stores. I already announced this product in the last Beauty Notes. If you read my blog regularly you’ll know that I am a fig fan so I simply had to buy this shower cream! The milky-white shower balm has a fruity-sweet and warm-spicy fragrance – it reminds me of an oriental fig dessert rather than fresh figs. The balm is based on sugar tensides and amino acid tensides plus grapeseed kernel oil, macadamia nut oil and coconut oil. It’s a nice autumn-time product! The Beauty Shower Balm costs 3.95 Euro and I bought it at my local DM store. I recently received a press sample of the new Mama Helping Spray Baby Blues from Aetherio Love & Science. The young German aromatherapy brand was re-launched some time ago; the product line-up offers aromatherapeutic products for children and families. The aromatherapy spray contains uplifting bergamot and balancing rose geranium to help young mothers who might be suffering from baby blues after the birth. The spray contains only 0.5% essential oils so it is gentle enough to use on baby skin and the scent is quite subtle. I don’t have a baby (or baby blues) but I still like the spray (I simply love rose geranium!). The spray is based on water, alcohol and an organic emulsifier. And speaking of post-natal depression: I recently found a video from Youtuber Ebru (Ebru was one of the first German beauty Youtubers) where she talks candidly about how difficult the first months after the birth of her child were. If you want to read more about Aetherio, check out this Beautyjagd post about the founder and her start-up. Or click on the brand’s homepage. I am very excited about the September issue of business magazine Biowelt which features my new column – I already showed you the cool rocket graphics on Instagram. In the column I am writing about beauty shopping in Seoul (which is always an experience!). The magazine is available online or as a print magazine and the current issue features some interesting topics like Vertical Farming or the relationship of the organic industry and the government. When I visited my local Rossmann drugstore I came across the new Shower Bomb Relax with fir fragrance from Austrian start-up Waltz7. I first thought it was a bath bomb but no, you’re supposed to put the shower tab on the floor of your shower, turn on the water and then the bathroom starts to smell quite strongly of forest greens. Didn’t Lush once have a product like this? Although the Shower Bomb smelled nice I’m not entirely sure what the point of this product is – most people will already use a scented shower gel, so you have two scents battling against each other? On the website of Waltz7 I read that the Shower Bomb is supposed to turn your shower into a wellness experience. Might be a nice idea if you’re staying in a hotel room. The Shower Bomb cost 1.49 Euro and lasts for two applications. Mysali…. what? 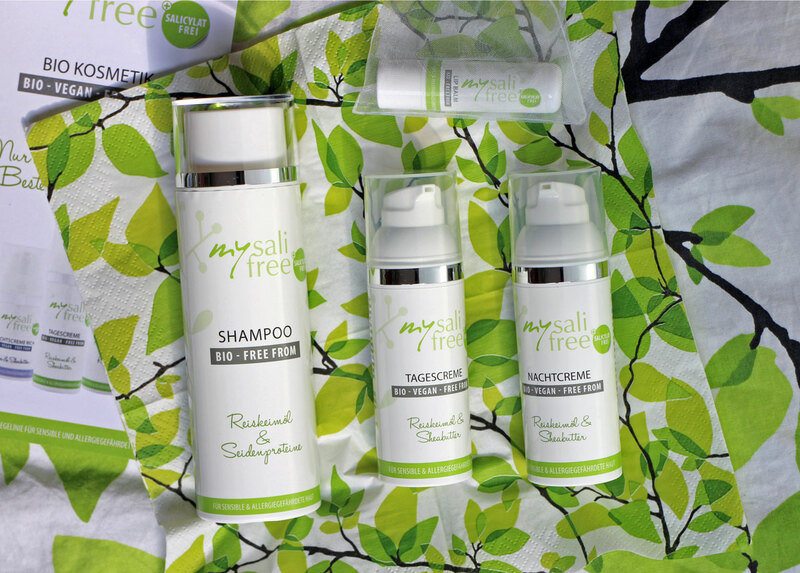 Mysalifree – that’s the name of a young organic beauty brand from Austria. 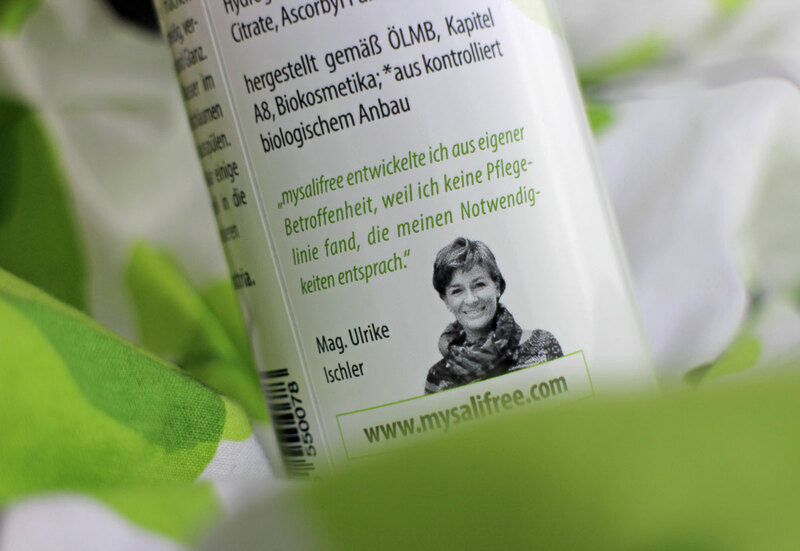 Mysalifree was founded in 2014 by Ulrike Ischler. I first met Ulrike at Natural Cosmetics Camp in 2014 and then saw her again at Vivaness 2015 trade show. 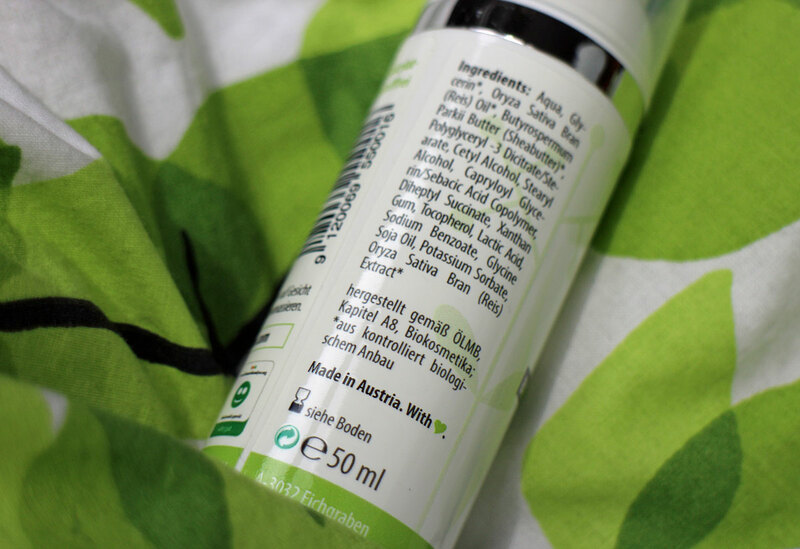 In my annual Best of Organic Beauty article for 2014 I listed Ulrike’s brand as one of my discoveries because mysalifree has a rather unusual ingredients approach. So I was glad that I could interview Ulrike for this Sponsored Post and find out more about her brand. Tell me a little bit about how you had the idea for mysalifree! How did I develop mysalifree – well, it was a simple reason really. Four years ago I had to give up my job as CEO of a consulting firm because I became sick. I suffer from a so-called “environmental allergy“ which means that I react strongly to many ingredients that are commonly found in food and cosmetics, like lactose, gluten, salicylic acid, histamine or fragrances. So I began searching for a skin care range that was suitable for my very sensitive skin – I needed cosmetic products that did not contain any of the ingredients I mentioned above. I visited many pharmacies, drugstores, perfumeries and spent a lot of time online until I realised that the type of product I was looking for didn’t exist anywhere on the world. I didn’t want to believe this at first but the longer my husband and I researched the matter, the clearer it became. There are many organic beauty brands, yes, but I was looking for something different: ingredients from controlled organic agriculture, products formulated without potentially irritating substances like salicylic acid, essential oils, fragrances, colourants or wool wax. And ingredients like parabens, mineral oils, sulphates, micro plastic and so on were out of the question anyway. I worked for many years in the pharmaceutical industry – my special focus was dermatology – and I had never some across a product range like I envisioned it. And then the idea came to me: why not create my own brand? After several months of intensive research, planning and many talks with other people I realised that I wasn’t alone with my specific skin care requirements: an increasing number of people (around 30% of the German population) have sensitive and irritated skin and can’t use conventional beauty products. So me and my husband decided to launch our own cosmetics company. It is really courageous to start your own organic beauty brand! Absolutely; all of our savings are invested in Mysalifree and our company Green Smile. 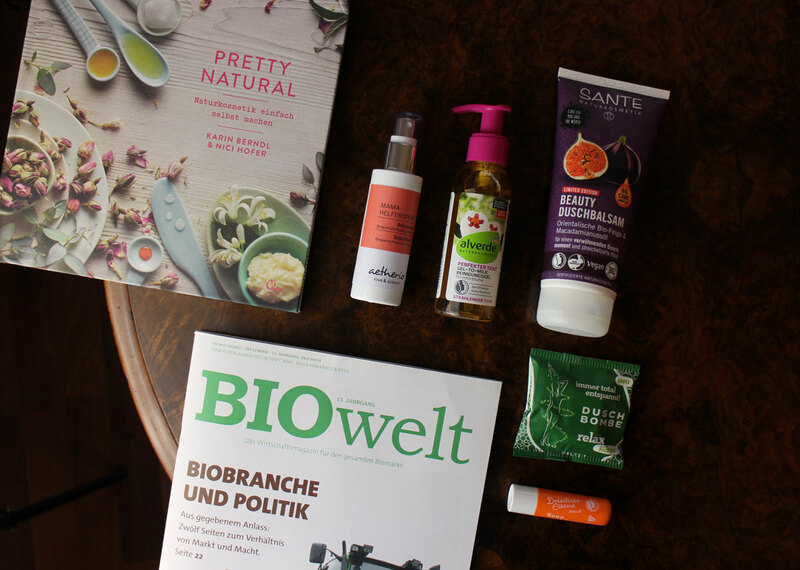 It is not easy to develop and market a niche product – there are so many big organic brands here in Germany and Austria – but it is so gratifying. When customers tell us how thankful they are for the products its gives us the strength to tackle the exhausting and stressful periods that any start-up company experiences. If you are 56 years old like me, a 70-hour week is exhausting! Where is Mysalifree located and who works in your company? Our company is headquartered in a single-family house in the beautiful Wienerwald region in Lower Austria and my entire family is involved in Mysalifree. Together with an expert I develop the cosmetic formulae and I’m also the brand ambassador, so to speak – I am mysalifree’s best customer. Every product that we launch I have tested thoroughly on my own skin. My husband’s professional background is the PR industry so he is responsible for logistics, IT and the financial side of the business. My son Marc has just finished his photography training and he is handling our product photography. We recently took new pictures of our entire product range – you have probably noticed that we have relaunched our brand visuals and the product packaging. Marc and I are also working on the social media side of mysalifree. A good friend of mine who lives in Northern Germany ships the parcels to our German customers and she also contributes to our blog. As you can see out team is compact but we work really well together. And we have more than enough to do! And the name of your brand…? 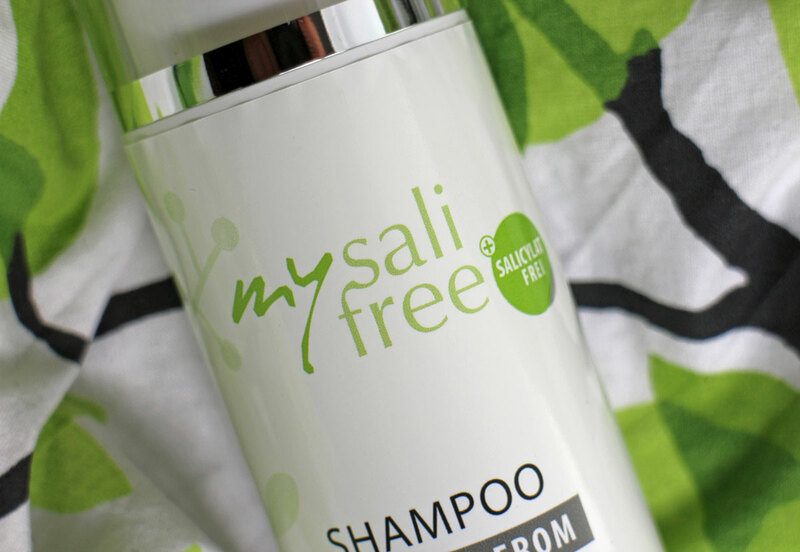 Mysalifree means what it says: the products are free from salicylates. Salicylates are derived from salicylic acid (our body also converts salicylates into salicylic acid). Salicylic acid also occurs in many plants – essential oils, for examples, or plant extracts. Plants use salicylates as a kind of defence mechanism against pathogens and germs. In beauty products, salicylic acid is often used as a preservative but also as an active ingredient against skin impurities or, in the form of an ester, as a UV filter. However, salicylic acid can have an irritating effect on the skin; the ingredient is actually forbidden for use on children below 3 years of age. Almost all cosmetic products contain some form of salicylates – which is why I can’t use them. So, what is actually in the mysalifree products? The better question would be: what isn’t in our products? 😉 All mysalifree products are organic, most are also vegan (we currently have 13 products and 11 of these are vegan) and „free from”. Our entire product range is certified by the Austrian ÖLMB, one of the strictest organic standards in Europe and – incidentally – the only organic certification standard issued by a government. All other European organic certifiers are private associations of brands and manufacturers. Austria is playing a leading role in the organic certification sector in Europe! The ÖLMB certification demands that at least 95% of the agricultural ingredients are derived from certified organic agriculture. Certain product steps, like deodorisation (extracting fragrance from oils), which are allowed by some certifiers are forbidden by the ÖLMB. And of course the products can’t contain parabens, sulphates, mineral oils and so on. We are very proud of our ÖLMB certification – many cosmetic manufacturers are unable to reach this standard but mysalifree does. In any case, Austria is a very organically-minded country: no nuclear power, no GMO, the country is one of the leaders against the TTIP, plus we have very strict organic certifications for foods and cosmetics – not bad for such a small country, don’t you think? 😉 . When I say “free from” I mean that our products do not contain potentially irritating ingredients like salicylates, gluten or lactose. In addition, we avoid essential oils because these can also irritate skin. What raw ingredients does Mysalifree use? We like to use organic grain and herbal oils because these are highly tolerable for even the most sensitive skin and do not contain salicylates. I am constantly looking for organic raw ingredients that we can use in our cosmetic products! The base oil in all our products is organic rice germ oil (our rice is Italian, by the way) which is ideal for very sensitive and irritated skin. Also good for sensitive skin is anti-inflammatory and healing millet seed extract or borage seed oil – you can find more detailed information about all our ingredients on the mysalifree homepage. We use CO2 extraction which is a very gentle extraction method. This means we can use oils and extracts that usually contain salicylates, like coffee extract or evening primrose seed oil. We also use organic plant and fruit oils, like corn oil, coconut oil, evening primrose seed oil, borage oil, pumpkin oil and pomegranate oil, and pure butters and waxes such as shea butter, cocoa butter, mango kernel butter or beeswax. All of our ingredients are from certified organic agriculture and are certified according to organic cosmetics standards. What is the basis for your recipes? We develop our product formulae together with dermatologists and organic experts and our work is based on scientific research on skin sensitivity/tolerance. Because Mysalifree’s ingredient combination is so unusual it is a real challenge to develop the products! All our products are tested salicylate-free by an independent institute which also tests the products for general skin tolerance. A study by Derma Consult Berlin has shown that 100% of their testers said they found mysalifree’s products to be completely skin compatible. And kosmetikanalyse.de (a website which is administered by the Swiss Foundation for Advancement of Skin Health) has given all of our products top reviews although this platform doesn’t even rate organic ingredient percentages. Why is organic so important for you? It is important for me to eat organic so why should I put non-organic cosmetics on my skin? Many people are not aware that our skin is the largest sensory organ in the human body (its total size is about 2 sq m). It isn’t just enough for skin to look beautiful; it also has several important functions: our skin protects us against environmental damage, gets rid of toxins and supports our immune system, to name but three of its most important properties. Many ingredients filter through our skin into our system and therefore into the body’s entire circulation. If the natural skin barrier is disrupted, bacteria or allergens can penetrate the skin and influence systemic allergies. Medical experts see this as one of the reasons why dermatitis (contact allergies) and environmental illnesses are on the increase. I recommend mysalifree not just for people with sensitive skin but for anyone who wants products to support their skin health. We offer high quality skin care products for sensitive and irritated skin and at the same time, organic quality, transparency and honesty! Which mysalifree products are your star products? Our bestsellers are the day cream, the night cream, the lip balm and the shampoo. For most people, the face is where skin problems are most visible – like redness, flaky skin or wrinkles. I am surprised that our shampoo is so popular – with a price point of 25.50 Euro this isn’t our cheapest product. Unfortunately the manufacturing process for the shampoo is very expensive so our margin on this product is actually quite low. However, we want to offer a basic range of products for the entire body. Many customers have irritated or sensitive scalps and there are few truly mild organic shampoos around. The mysalifree shampoo has also won a few awards. We have just launched two new products, this time with a soft coconut fragrance! Since you were mentioning product prices – what is mysalifree’s general price range? The price range of our products is at the level of pharmacy cosmetics. We are a start-up, our production volume is still low and that makes packaging, products and logistics more expensive. All of our active ingredients are organic and CO2 extracted, our product range is certified organic; we make sure that all products are dermatologically tested and salicylate-free; we use the more hygienic airless dispenser in our packaging – all of these have an effect on product costs. The big advantage of our products, however, is that they are very economic and last for a long time so you should use them sparingly. And this makes them quite affordable again: a 10ml face oil will last me for a month. Finally, what is your favourite way to relax when you don’t work on mysalifree? Nature is really important to me: I grew up in Tyrol near the Italian border and love the big mountain ranges but also the quiet, leafy forests in the Wienerwald region where I live now. And twice a year I simply have to go to the seaside, usually in spring or autumn time. 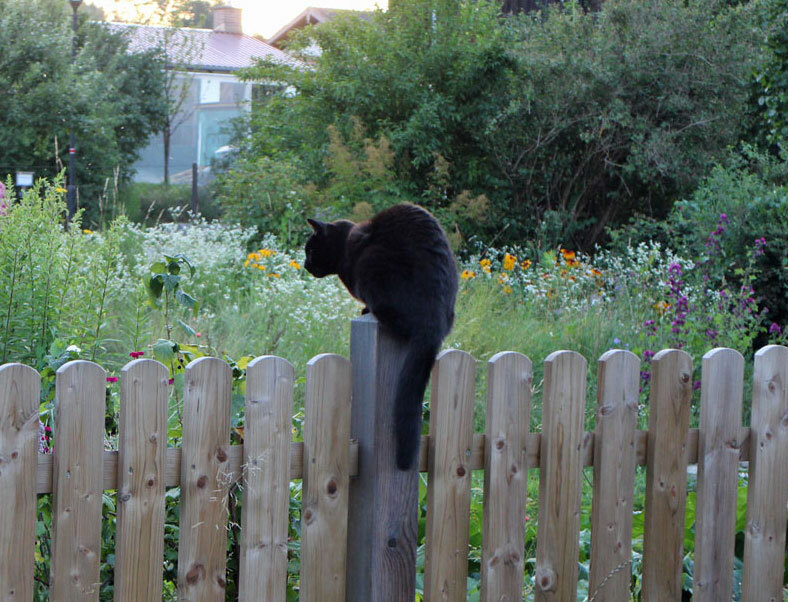 I also love our garden here; we have many old trees and rhododendron and hydrangea bushes and everything is, of course, organic. Nature gives me strength and it also offers me relaxation – and I love its beauty! At mysalifree we try to support nature by living as sustainably as possible. We do not use outer packaging for our product ranges and all containers are fully recyclable. More information about mysalifree’s ingredients and their properties, about organic beauty, skin compatibility and skin health can be found on our website. Or follow us on Facebook, Instagram or Pinterest – we are always glad about new followers. 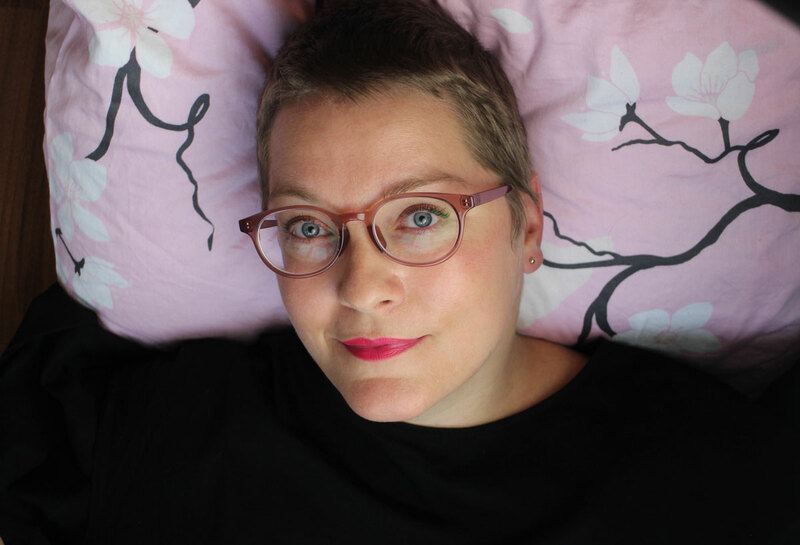 Ulrike, thank you for the interview! On Beautyjagd I have already introduced several mysalifree products, like the coffee-scented body lotion, the skin care oil, the eye care balm or the shampoo. You can buy mysalifree through the brand’s own webshop or from selected retailers. My week started with a visit to Hofgut Oberfeld farm near Darmstadt, the location of organic supermarket chain denn’s Bio-Blog’s annual blogger meeting. Farmer Thomas Goebel took us around the Demeter-certified farm – we visited the open cow barn, the mobile chicken coops and the fields. Hofgut Oberfeld also offers local citizens the opportunity to purchase a share in the business or simply work on the farm if they want to – a kind of communal farming concept. The farm also has a store and a small café which is where we had lunch before participating in something rather unusual: a dog coaching with Renée Herrnkind. I’ve never been a big fan of large dogs but after one hour of coaching I began to feel much more comfortable around them. During the exercises it was fascinating to see how the three dogs reflected the way we subconsciously behave. Let’s stay on the topic of Bio-Blog: I did some intensive research into organic cleansers and detergents for my new Bio-Blog article – what is the composition of organic detergents, how do they differ from conventional cleansers, and what should you pay attention to when using eco detergents. Enjoy! I am currently getting to know Alsiroyal, an organic brand from Upper Bavaria. Alsiroyal is a classic German Reformhaus brand (Reformhaus is a very distinctive – and very German! – type of health food store which is quite common in Germany, Austria and some parts of Switzerland). If you live in Germany and sometimes shop in Reformhaus stores you might be familiar with Alsiroyal’s Anguraté stomach tea or their nutritional supplements. However, Alsiroyal also has a Natrue-certified organic beauty range which was launched five years ago. The line-up includes several special treatments and ampoules – a product category which I like. Anyway, Alsiroyal had recently sent me a press sample of their Hyaluron 5-Effekt Ampoules. This special treatment contains five types of hyaluronic acid in different molecular sizes: high-molecular hyaluronic acid plumps up the top layer of the skin whilst the lower layers are nourished with four types of low-molecular hyaluronic acid. One ampoule is enough for two applications; you can apply the treatment to face, neck, décolletage or hands – or do as I do and use the ampoule for the Korean 7-Skin Method. I applied the contents of the ampoule to my face in several layers until my skin felt really hydrated and plumped-up. This effect lasted until the next day – wow! The gel-like liquid has a very light lavender fragrance. You can check out the ampoules on Alsiroyal’s website. One set of three ampoules costs 14.90 Euro. After I finished the Makeup-Remover from NZ brand Living Nature (which I really liked) I am now going back to French micellar waters for my makeup cleansing needs – I have a rather large stockpile of various micellar waters which I need to use up 😉 . I bought the Reactive Eau Micellaire Apaisante from Eau Thermale Jonzac at a French parapharmacie this spring. The Reactive line is designed for sensitive skin so the INCI listing is nice and short. This makes it a good choice for people who prefer unscented products (or for those who hate long INCI lists!). The Eau Micellaire is based on water, camomile water, glycerine, an emulsifier (which acts as a tenside), bisabolol, lactic acid and a certified organic preservative complex. The micellar lotion has a very light camomile fragrance and removes my makeup quickly and thoroughly, including eye makeup like eyeliner and (non-waterproof) mascara. And it doesn’t sting in my eyes either! I think it is a pity that Eau Thermale Jonzac still isn’t available in Germany – it is such a great thermal water brand! You can check out the full list of ingredients on the brand’s homepage; on Mademoiselle Bio two bottles cost around 20 Euro. The October issue of trade magazine BioHandel includes an interview with me in which I talk about what it is like to work as a blogger. 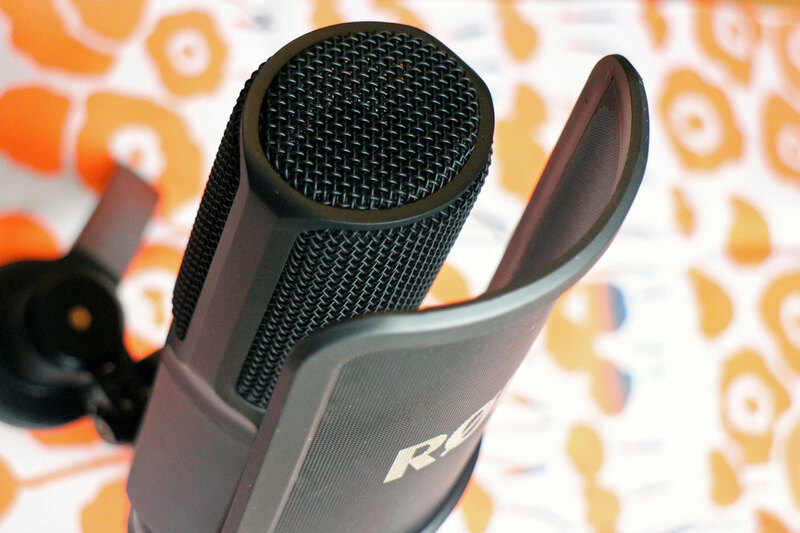 The interview is part of a larger feature on how the organic industry can use social media and Internet resources to market itself better and to boost the public’s interest in organic products. Unfortunately the interview and article are only accessible for BioHandel subscribers. Natrue-certified German beauty brand Hej Organic has just launched three sheet masks. I found one of them, The Ultra Hydrator, at a local outlet of German perfumery chain Douglas. The mask is priced at 4.99 Euro. Although Hej Organic is not a Douglas own label brand its products seem to be more or less exclusive to Douglas stores. Anyway, the sheet mask is made from organic cotton wool and is saturated in a liquid which is based on water, oat extract and plant-based propylene glycol. The ingredients also include glycerine, hyaluronic acid, lactic acid and sodium PCA as well as St. John’s Wort and amaranth extracts and hemp oil. The packaging looks rather stylish: take out the sheet mask, remove the protective layer and then place it on your face for 10-15 minutes. The mask material is thick and firm and a fairly good fit for my Caucasian face shape (which is sometimes a problem with Asian masks). Still, the mask was still a little loose on my face – no “second skin” effect as promised on the packaging! The mask is scented with light floral and almond notes and it cools the skin nicely. After I took off the mask my skin felt moisturised and smooth – however, in terms of plumping and hydration, the Alsiroyal ampoule I mentioned above was much more effective. There was a little essence left in the packaging which I used as base for my night time face oil. 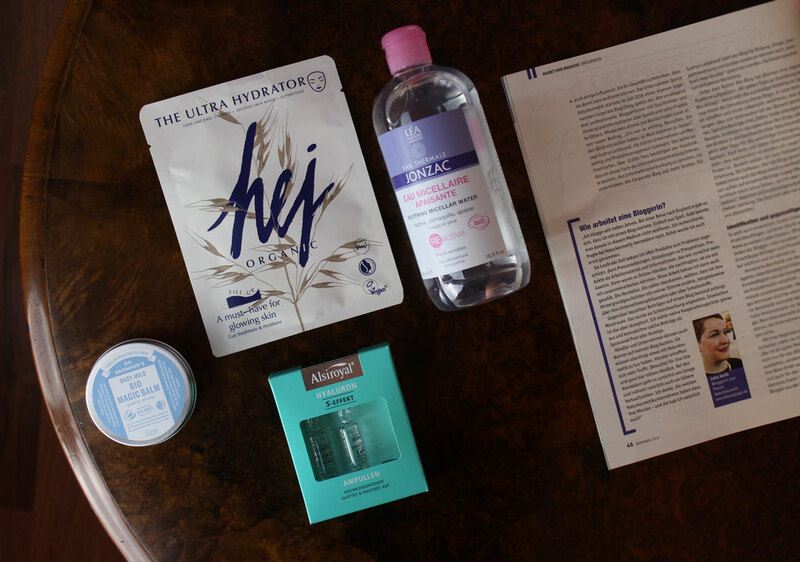 Let’s see if the other two sheet masks from Hej Organic work any better… However, if you’ve never used a sheet mask before and want to try a certified organic mask, Hej Organic’s sheet masks should be a good option – the price is ok and the brand is widely available which is pretty cool. After all, there are still not that many certified organic masks available in Germany! You can find more information on Hej Organic’s website. German drugstore retailer DM’s organic own label brand Alverde has launched a whole clutch of new products, including the spice-scented Shower Gel Indian Spirit, the new foam bath additive Chai Latte (packaged in a sachet), the Sage-Lime Deo Stick and soon there will be the bi-annual update of the brand’s colour cosmetics portfolio. Every year I look forward to the Christmas gift sets from German aromatherapy brand Primavera – I have already seen some of their 2017 Christmas sets around! German brands Sante and Logona will also launch new winter-time limited edition products. Organic deodorant stick brand Schmidt’s from the US has launched bar soaps to match their deo stick variants, like Rose Vanilla or Cedar Juniper. More information is available here. When I was younger I imagined that at the age of 50 I’d be a wise elderly lady 😉 . Well, I’m in my early 40s now and the whole “lady” thing hasn’t really happened yet – neither has the wisdom, by the way; I think that’ll probably come later. I’ll check back when I’m 60 years old! The age of 50 is also when, presumably, I’ll be in the middle of my menopause. I’ve read that menopause is actually a kind of second puberty, a new and tumultuous life chapter in which established things and patterns are all thrown about. Sounds exciting! The menopause (also called climacteric period) is the time in the life of a woman when her menstrual cycle begins to slow down. It usually starts when you’re in your middle 40s and can last until your middle or even late 50s. The frequency of your menstruation decreases and there are hormonal changes which can result in hot flashes, emotional swings and even bouts of depression. This life phase is also often a time when family circumstances change – children are growing up and leaving the house; partnerships or marriages might come to an end, or there might a new career path. All of this can sound a little scary. And it doesn’t help that in our society, the menopause process (because it is a process which can last for ten years or more) is primarily associated with negative things. Which is pointless because every woman will sooner or later go through menopause. It is simply a fact of life that we are growing older! However, since this life chapter is characterised by changes anyhow – the German term for menopause, “Wechseljahre”, is actually quite evocative, the word translates as “changing years”! – it is also a very good time to take stock of your life. Look at where you stand at the moment and decide whether there are any changes you’d like to make and where you want the next decades of your life to take you. Change often seems frightening at first, but in my own experience life changes have almost always led to something unexpected, something positive and overall amazing: more freedom, more time for my own hobbies and interests, more independence and more space to focus on my own needs and demands. And this is also what I hope will happen after my menopause! For this Sponsored Post in cooperation with German aromatherapy brand Primavera, I have interviewed Primavera’s product manager Ramona Klügl. Ramona’s dissertation topic in her aromatherapy study course was the menopause, so she was a very good choice to lead the product development of Primavera’s new range Frauenwohl (which roughly translates as „Woman’s Well-Being“). Frauenwohl offers two aromatherapy products which were specifically developed to help women who are going through menopause. 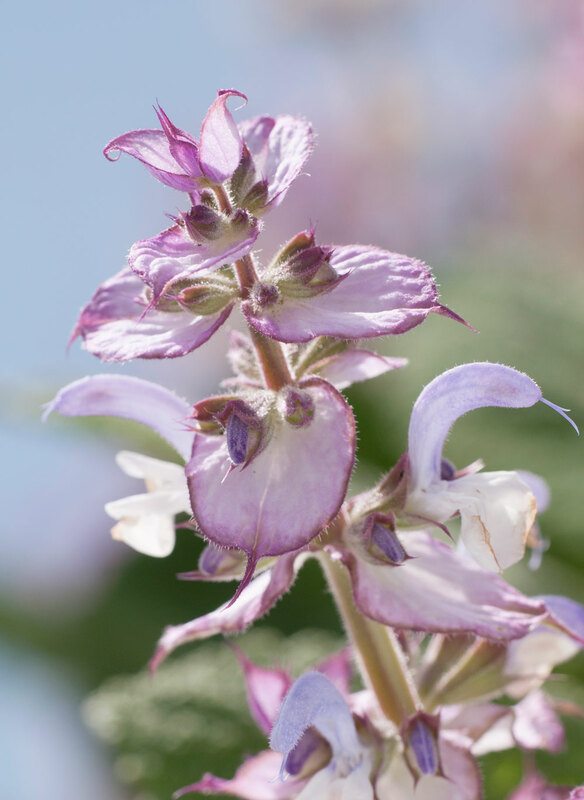 The key plant extract in Primavera’s Frauenwohl range is Clary Sage (Salvia Sclarea) which is not to be confused with the „normal“ garden sage that you put on your food! Clary Sage is an essential oil which is derived from the entire sage plant by steam distillation. It is an essential oil that is especially beneficial for women of all ages: Clary Sage has a balancing effect, is antispasmodic (it alleviates cramps thanks to its Sclareol molecule) and helps to modulate hormone levels. Clary Sage essential oil does not contain hormones so it is not used in conventional hormone replacement therapy or in even in phytotherapeutic plant hormone therapy. No, this essential oil boosts the body’s hormone regulatory mechanism in the pituitary glands so it helps the body to heal itself. Clary Sage also stimulates the production of serotonine and endorphine (the body’s “happiness” hormones) so it helps to balance emotional swings. In addition Clary Sage boosts your creative power and makes you more open for inspirations. It is also very skin-friendly because it mostly contains esters. All in all it is the perfect essential oil for stressful life phases! 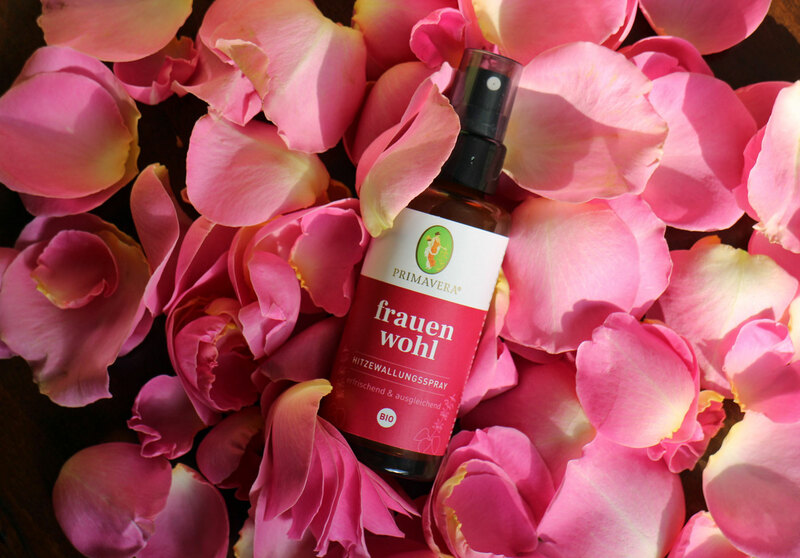 The product name Frauenwohl Hot Flashes Spray already indicates what this aromatherapy body spray does: it cools and refreshes you during hot flashes which is something that many women experience during the menopause. The body spray has a very light gel-like texture so it’s a fine mist which you can spray on face, neck or décolletage. The Hot Flashes Spray is based on four different hydrosols: rose water, peppermint water (for instant coolness), clary sage water and sage hydrosol (which helps to inhibit sweating). It also contains four essential oils – clary sage, emotionally uplifting rose absolue and soothing bergamot which helps against fears. In addition, rose geranium oil has a balancing effect and reduces stress hormones which can help the body to relax during a hot flash. It is also a skin-friendly oil and suitable for dry skin. „We wanted to create a fragrance blend that would help women to briefly disassociate themselves from a stressful situation; to give them a beautiful moment when they breathe in the fragrance“, Ramona explains. I really like the floral-rosy scent of the body spray so I use it whenever I need a boost of relaxation or encouragement. Simply spray the scented mist on your face, neck, décolletage or lower arms. You don’t have to be worried about photosensitivity, by the way; the essential bergamot oil is very low in furocoumarins. I read somewhere that hot flashes can also show you how much power and energy are contained in your own body – an interesting thought. Frauenwohl Hot Flashes Spray from Primavera contains 50ml and costs 12.90 Euro. 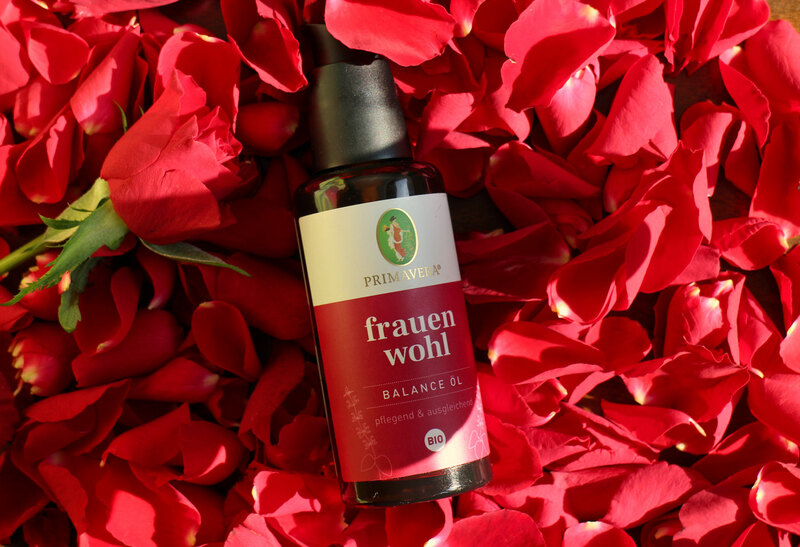 The second Frauenwohl product is the Balance Oil which can be used to massage the lower belly or lower back, or the insides of your thighs. It is a moisturising body oil which is based on organic sweet almond oil, coconut oil, macadamia nut oil and avocado oil plus evening primrose oil and pomegranate kernel oil. The oil is packaged in a bottle with a pump dispenser so it is easy to apply the correct amount. If you want to find out more about the composition and skin care effects of plant oils, check out my Oil Library articles here. The Balance Oil has a different composition than the Hot Flashes Spray. Of course the oil contains balancing clary sage but another important ingredient is essential oil of Monk’s Pepper (Vitex Agnus Castus). This oil is distilled from the seeds of the Agnus Castus plant. In European phytotherapy lore, Agnus Castus is a well-known healing plant. However, the essential oil that is derived from the plant isn’t commonly used. In France, Agnus Castus is popular because of its effectiveness. Monk’s Pepper essential oil helps to boost the body’s production of progesterone which in turn helps to balance out hormone levels. Balance Oil also contains essential oil of ylang ylang which on a psychological level decreases fears and helps you to get in touch with yourself and your femininity. Finally, the blend contains de-stressing rose geranium. When I smell the Balance Oil I first detect the ylang ylang and some herbal notes; later the rose geranium becomes more prominent. The scent is very different from the fragrance of the Hot Flashes Spray. Primavera recommends using the Balance Oil as part of an evening ritual: gently massage the oil into your belly, the lower and the inside of your thighs. You can also use the oil when you suffer from PMS (this is what I did): first I sprayed the Hot Flashes Spray on the skin and then applied a few drops of the Balance Oil. It feels amazing! The Frauenwohl Balance Oil from Primavera contains 50 ml and costs 16.90 Euro. Think positively: The most valuable tip is also the simplest – positive thoughts also affect your reality. When you are going through particularly intense or perturbing phases, remind yourself of the positive things that this new life phase can bring you. More freedom, more serenity, more wisdom or perhaps even a new role in life? Celebrate these positive thoughts with a small ritual: take five minutes for yourself every evening and integrate the Balance Oil into your evening routine. While you massage the oil into your skin, think about all the positive things that you have experienced that day. Primavera products are available through the brand’s own webshop, in selected online stores and in organic supermarkets and speciality retailers. I received all products for this post from Primavera.